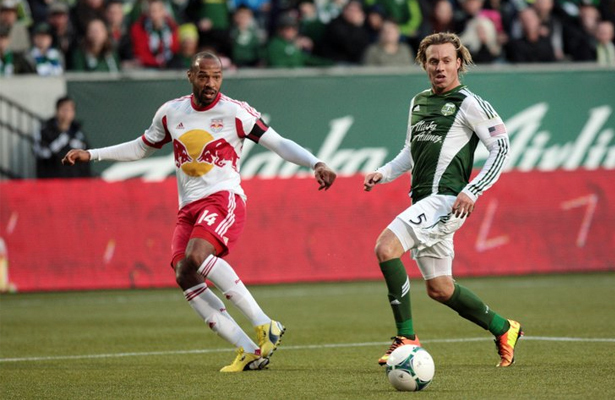 The Portland Timbers are away to the New York Red Bulls this Saturday. New York finished last season with the best regular season record, and won the Supporters Sheild. This season hasn’t started out nearly as well going their first six games without a win. They’ve been losing to poor teams, and beating half decent teams, although in the Eastern conference, there aren’t many decent sides. Tim Cahill has only started 7 games so far this season, and now he’s gone to the world cup. Thierry Henry has 3 goals and four assists so far this season. The man is pure class so you can probably expect more of the same this weekend. “He shoots with his left, he shoots with his right. Thierry Henry is dynamite.” Péguy Luyindula has been coming off the bench recently, and has two goals to his name, but the man of the hour is Bradley Wright-Phillips. The english man has NINE goals so far this season. If he keeps up this pace, he’s on course for a record-breaking season. Dax McCarty is still the solid midfielder, holding the team together. The beast at the back is Jámison Olave. The Columbian was signed from Salt Lake before the 2013 season and was a huge reason the New Yorkers lifted the supporters shield. In Lloyd Sam, Jonny Steele, Ibrahim Sekagya and Roy Miller to name but a few, the Red Bulls have a lot of average players which ultimately help balance the wage book, but hurt the teams overall performance. Some Timbers fans might consider Eric Alexander in that group, but I wouldn’t. Alexander has played every game this season with four assists to his name. He works hard for every ball, and can open up defenses. Players usually up their game against their former clubs. MLS journeyman Bobby Convey, who joined from Toronto in the offseason, has played in roughly half of the teams games. In those games he has provided nothing. Englishman Richard Eckersley also joined from Toronto and contributed some early season calamities in defense. He’s not been playing much either. For the Timbers sake, it would be great if these two got a run out. The one puzzling move in the offseason, was declining their option on Fabián Espíndola. Currently tearing up the league for DC United, NYRB didn’t even get a transfer fee for the Argentinian. The Red Bulls are on a two game losing streak, and they have shown they are weakest towards the end of the game. If the Timbers can keep Henry & Wright-Phillips off the scoreboard, then they should have a decent shot at taking some points in New York.